The 12-month forecast (below) shows exceptional water deficits in Tasmania and along Victoria’s coast. Deficits are forecast for much of the country’s interior, including large pockets of exceptional deficit. Intense deficits are also forecast near Darwin in the north, along the southern shore of the Gulf of Carpentaria, and near the Gregory Range in northern Queensland (QLD). Moderate to extreme deficits are forecast for Australia’s southwest tip, south of Perth. Surplus conditions are expected in West Australia’s Kimberley region, Arnhem Land in Northern Territory, and in eastern Queensland around the Mackenzie River and also west of Bundaberg. Deficits of varying severity are expected in pockets of New Zealand, and severe deficits are forecast for New Caledonia. As is apparent in the map series above, the forecast indicates a transition away from significant deficits overall. In the near-term forecast through June, exceptional deficits are expected to shrink, persisting in several large pockets in central Australia’s Channel Country. Other areas of intense deficit include western Tasmania, coastal Victoria, and Darwin in Northern Territory. Moderate to severe deficits are forecast for Australia’s southwestern tip and the northeast corner of New South Wales. Moderate deficits are forecast throughout the remainder of New South Wales, much of South Australia, Northern Territory, and much of the northern half of Western Australia. Conditions of both deficit and surplus are expected in Kimberley Region, WA as the area transitions. Surpluses will diminish in Arnhem Land NT and in the Mackenzie River region of QLD, but will increase in the Atherton Tablelands of Far North Queensland. Moderate deficits will continue to emerge in North Island New Zealand, but conditions in South Island will return to near-normal. Deficits in New Caledonia will moderate. 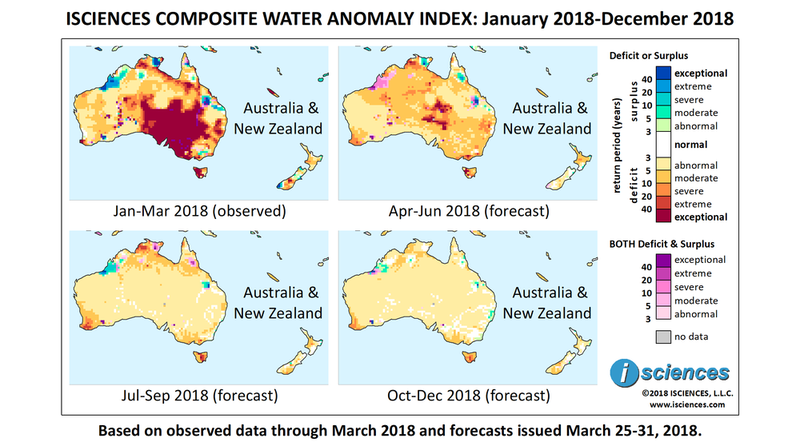 From July through September merely mild water deficits are forecast for much of Australia. However, deficits in the southwest tip of West Australia will upgrade to extreme, deficits in western Tasmania will become mild but intense deficits will emerge in the east. Extreme deficits will persist near Darwin. Surpluses in the Atherton Tablelands of Far North Queensland will begin to transition as deficits move in, and surpluses will re-emerge in the Kimberley region of WA and in the Mackenzie River region of QLD. Some moderate deficits will continue to emerge in a scattered band across northern Australia, as well as in New Zealand and New Caledonia. The forecast for the final months – October through December – indicates conditions similar to the prior three months, though with some downgrade in intensity. Farmers in New South Wales, Australia are facing what is perhaps the driest period in a decade. Some areas have received around a third the expected rainfall, and record breaking temperatures are 10 degrees above average. Ranchers are starting to cut livestock herds as feed grain is becoming less available. Conditions across the state are expected to continue to deteriorate through the winter months though lower winter temperatures will help. The higher than seasonable temperatures and dearth of rainfall are fanning the flames across South Australia, New South Wales, and Victoria. A fire south of Adelaide had local officials calling on residents to evacuate. Near Sydney, a bushfire that officials are saying was deliberately set destroyed 2,500 hectares and forced 700 residents to flee their homes. Damaging winds swept through Victoria following bushfires there that caused the closing of schools and concerns over air quality. Downgraded Cyclone Nora brought flooding rains to the northeast coast of Queensland. Drenching rains flooded agricultural fields and roads near Cairns, cutting off some towns along the coast. This was the fifth serious flood event in the state in the past month. Citizens were warned that flood waters may conceal bull sharks and crocodiles seeking calm places to wait out the flooding. A time-sequence of satellite imagery from NASA’s MODIS sensor depicts a pulse of flood waters in Queensland’s Channel Country draining towards the dry interior. Periodic flood waters will settle into broad shallow lakes in south-central Australia.